Flag of Morocco (SVG implementation). 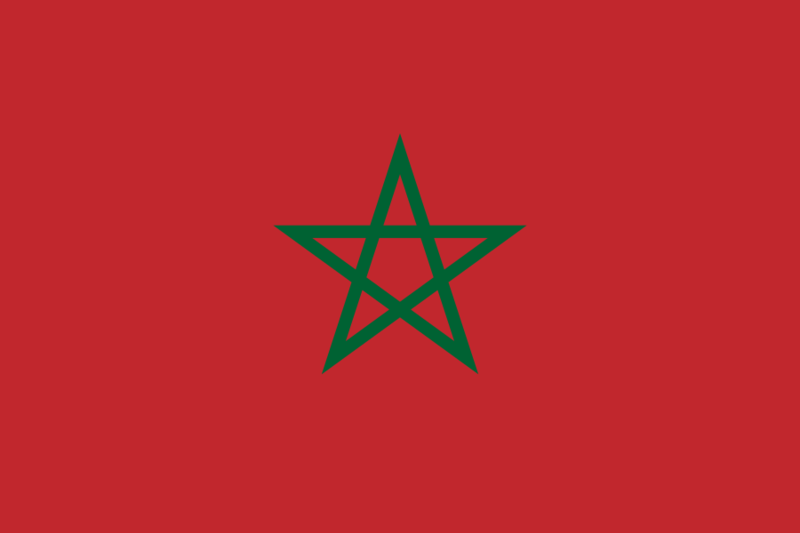 Date 17 September 2005, based on the Moroccan royal decree of 17 November 1915. Translation: Cherifian Dahir in the distinction of the Moroccan flag — To be known from this book, may God uphold its value and to be around the centre of grace and joy its orbit, that due to the promotion of our cherifian kingdom affairs, the spread of its glory and its pride, the need to assign a flag that distinct it from the rest of the kingdoms as that our sacred ancestors flag use to be very similar to some other flags especially the ones used in the marine signs, our noble vision decided to distinct our joyful flag by making the five pointed seal of Solomon in the middle in green, asking the almighty god to keep it waving with the winds of fortune and ambition for this time and the becoming, Amen and peace. Translation: Cherifian Dahir number 1.05.99 issued in 20 Shawwal 1426 (23 November 2005) about the characteristics of the Kingdom’s emblem and national anthem — In accordance with the seventh article of the constitution, the emblem of the Kingdom shall be a red flag with a five-pointed green star in the center. The flag shall be made with fabric of canna red, opaque and rectangular in shape. The star shall be open, green like the leaf of palm trees, made of five continuous branches and woven in the same fabric where it must be visible on both sides of the flag. One of its points must point upwards. The hoist of the flag equals two thirds (2/3) of its fly. The star is inscribed in an invisible circle whose radius equals one sixth (1/6) of the fly’s length and whose centre is the intersection point of the invisible diagonal lines of the flag’s rectangular. The width of each one of the branchs of the star shall be 1/20 of its length. This is an anonymous work or pseudonymous work and 70 years have passed since the date of its publication (or creation, if not published within 50 years). This is a collective or audiovisual work and 70 years have passed since the year of its publication (or creation, if not published within 70 years). This is a work of applied art and 70 years have passed since the date of its publication (or creation, if not published within 50 years). This is another type of work and 70 years have passed since the year of the author’s death. You must also include a United States public domain tag to indicate why this work is in the public domain in the United States. Note that a few countries have copyright terms longer than 70 years: Mexico has 100 years, Jamaica has 95 years, Colombia has 80 years, and Guatemala and Samoa have 75 years. This image may not be in the public domain in these countries, which moreover do not implement the rule of the shorter term. Côte d’Ivoire has a general copyright term of 99 years and Honduras has 75 years, but they do implement the rule of the shorter term. Copyright may extend on works created by French who died for France in World War II (more information), Russians who served in the Eastern Front of World War II (known as the Great Patriotic War in Russia) and posthumously rehabilitated victims of Soviet repressions (more information). 01:29, 27 February 2015 900 × 600 (2 KB) Fry1989 No construction sheet provided that 1915 proportions are no longer in effect.